Technical Analysis with Elliott Wave, trends and charts for Stock trading where we strive to bring the best of all forms of TA out in an easy to read and understand format that can benefit all investors. Copyright © 2009-2011. All Rights Reserved. Click here for a live and updated chart!!! 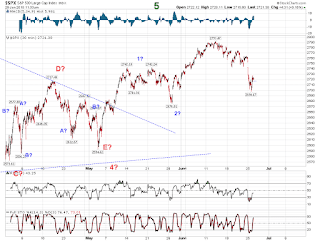 The SPX opened gap up this morning and quickly filled the gap, currently we are trading up now $4.31 at the $2721.38 level. 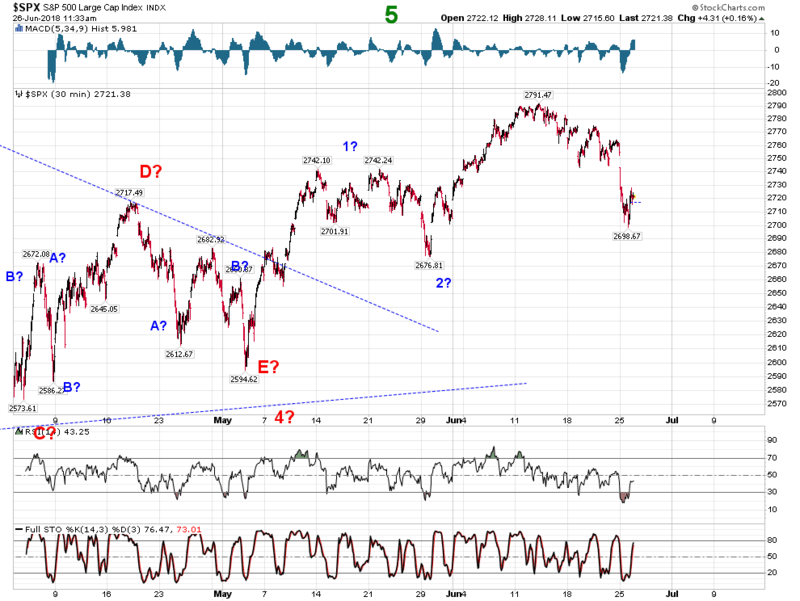 Yesterday's price action really put the damper on the 5th wave up. Please help keep this blog going! Your contributions are important to the future of this blog. Help keep this blog free and donate a few bucks every couple of months, otherwise I will be forced to go to a pay-style service, something I am not excited about doing!!! The new home for EW trends and Charts!!! The Ultimate Technical Analysis Handbook EWI's brand-new 50-page eBook, The Ultimate Technical Analysis Handbook, will show you the various methods of technical analysis they use every day and teach you how to use these powerful tools for yourself Learn more about this free eBook, and download your copy here. The information contained on this website and from any communication related to the author’s blog and chartbook is for information purposes only. The chart analysis and the market recap do not hold out as providing any financial, legal, investment, or other advice. In addition, no suggestion or advice is offered regarding the nature, profitability, suitability, sustainability of any particular trading practice or investment strategy. The materials on this website do not constitute offer or advice and you should not rely on the information here to make or refrain from making any decision or take or refrain from taking any action. It is up to the visitors to make their own decisions, or to consult with a registered professional financial advisor.This websites provides third-party websites for your convenience but the author does not endorse, approve, or certify the information on other websites, nor does the author take responsibility for a part or all materials on the third-party websites which are not maintained by the author. We hold the personal information we collect when you register to our website and communicate with us through email as confidential and we do not share it with anyone.